Making sense of disaster, history and myth. According to ancient Japanese legends earthquakes are caused by a titanic catfish, Namazu. Namazu is said to live buried in the depths underground. By moving his giant tail he is said to be powerful enough to shake the entire earth. His nature is believed to be chaotic and he is known as one who enjoys causing havoc. Namazu is said to only be able to be controlled by the god Kashima. Kashima with the help of a powerful capstone pushes the enormous catfish against the underground and doing so immobilizes him. However Kashima is sometimes believed to get tired or distracted from his duty and it is then that Namazu can struggle and cause an earthquake to happen and disaster to strike! 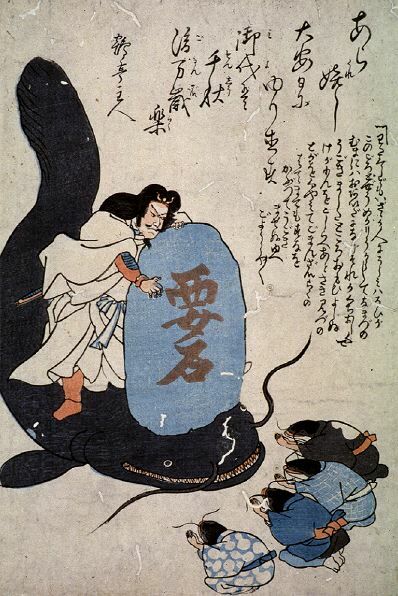 In the print on the left we see Kashima immobilizing a guilty Namazu with the capstone. 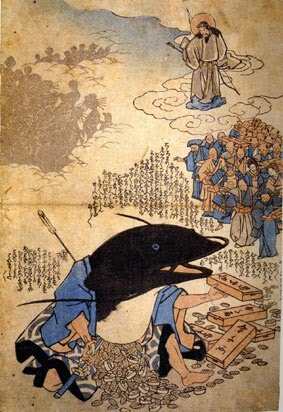 Smaller catfishes, who represent earthquakes of the past, watch the severe punishment of Namazu for his unruly behaviour. Namazu is said to rationalize his troublesome behaviour as a justifiable response born out of envy of other species of fish considered more desirable in Japanese cuisine . 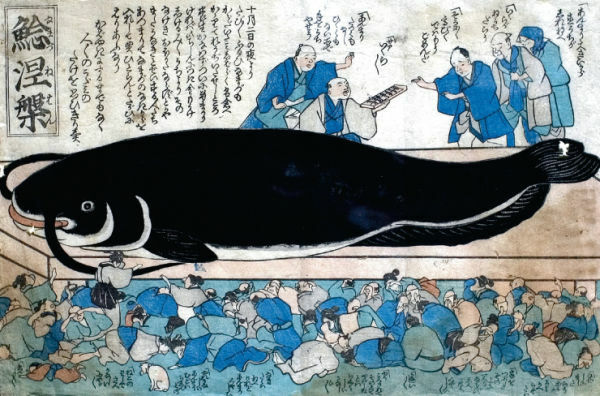 During the 19th century and after the 1855 earthquake of Edo (modern day Tokyo) it became popular thinking that Namazu was punishing human greed. together and put pressure on greedy people to redistribute more equally their wealth. In this new more complex role as a spiritual guide of mankinds actions. Nazamu takes on the dual role of Yonaoshi Daimyojin, literally the 'god of world rectification'. In the print to the left we see Namazu in this form of Yonaoshi Daimyojin perpetuating his harakiri - 'Seppuku namazu', or ritual suicide. With this self sacrifice he is believed to provide gold and money, dropping from his belly, for the people. Some of these depictions, like the one to the left, are believed to have magical powers. It is said that whoever has them in their home will be protected from earthquakes and experience 10,000 years of luck. 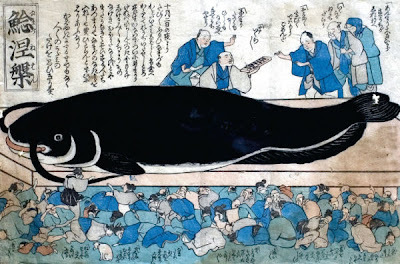 There are now existing more than 300 known classic images of Namazu that were mainly a response of the Edo earthquake. By trying to depict such "positive aspects" of the earthquake, such as the redistribution of wealth, artists hoped to raise the morale of the survivors. What can we learn from history? That the human spirit is strong. That we can and do-create powerful myth, media and art in order to support one another and pull through difficult times. That we can choose to focus on the positive, and on survival. That we as human beings have wonderful strategies for creating sense and meaning out of the world around us. What is important is not necessarily what we believe or it's degree of 'accuracy' or exactly how we make sense of the world and events around us. It's not the metaphors we use, or the structures of religion, myth, physics, metaphysics, science, etc, that we use to make sense of things and negotiate them, but simply that we do, we find a way. We persevere. That we can not only live to see another day, but pass on our myths and arts as creative treasures for generations to follow and be inspired from as they face their own struggles and seek out new myths, new arts and sciences. That even with great destruction, comes a new dawn, and new creation.